How many asset records can I manage with Asset Manager? How can I backup the Asset Manager database? Does Asset Manager work on Windows 10? Does Asset Manager work on a Mac? How long is the Asset Manager license valid? How do I calculate depreciation for an asset? Asset Manager comes in two different editions, and the license key you purchased must match the edition that you're entering it in. For example, a license key for the "Standard Edition" will not work in the "Enterprise Edition". You can check to see which edition you have installed by opening Asset Manager and reading the caption at the very top of the window. If it doesn't match the edition of the license key that you purchased, download and install the matching edition here. 16 billion - although the application doesn't set a limit, the database has a limitation of 16 billion records per table. Yes. Asset Manager is compatible with Windows 98, ME, NT, 2000, XP, 2003, Vista, 7, 8, and 10. No sorry. Asset Manager requires Windows 98, ME, NT, 2000, XP, 2003, Vista, 7, 8, or 10. 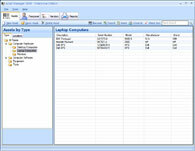 Your Asset Manager license key will work in the version of the software you purchase without limitation or expiration. You also receive free updates for 24 months. Updates *after* 24 months can be purchased for 50% off the regular price. However, you are never required to update, so you may continue to use the older version for as long as you want with no additional charges. 2. Click on the "Options" button in the toolbar. 1. Set your organization's Fiscal Year End on the Options form if you haven't already (menu item Tools --> Options --> Depreciation tab)..
2. Set the Purchase Price, Depreciation Method, Recovery Period, and In Service Date on the asset form - finance tab. 3. Click the Recalculate button to update the depreciation grid.